Do you know who Scott is? And we don't mean Walter Scott, author of swashbuckling historical novels of high romance. This is about Cyril Scott, composer, pianist, poet and mystic-spiritualist (1879-1970)… His most important piano works are recorded in the first release in our brand new Geniun CD series — "Un!erhoert" devoted to Unheard Of! piano repertory. 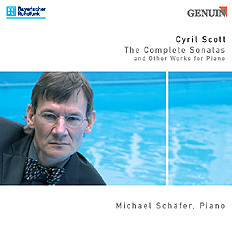 With wondrous flourishes and bewitching dexterity, Munich pianist Michael Schaefer carries a torch for the boldly unconventional Scott. These exciting pieces for piano solo move between jazzy passages and exotic flair, basking in Late Romanticism and the realism of 1920s Neue Sachlichkeit. They represent Scott’s output over a period of nearly 60 years! Essential listening. The final work, from 1963, is simply a message from another world…If you don’t know Cyril Scott yet, now is the time.